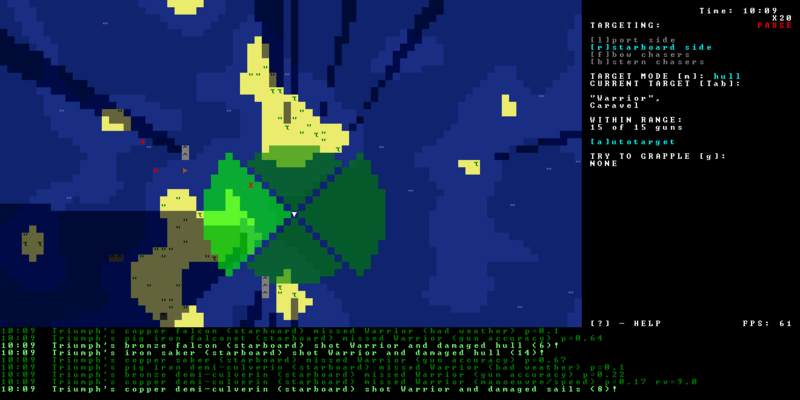 An in-development ASCII naval-themed game. Manage your guns and men to sink or capture the enemies! Learn to position your ship using wind, use the best of the artillery you have on board, carefully prepare a boarding party and struggle to grapple the enemies! 2 missions - a randomly generated naval fight scenario and pre-built finely balanced special scenario. Alpha-version of procedural world generation module included - you can create and browse your own Ocean World Of Thousand Islands. An open world with a lot of ports and full of other ships you can interact with: merchants, navy and of course, pirates. Complex economical system of trading between different islands, which merchant gameplay deep enough. 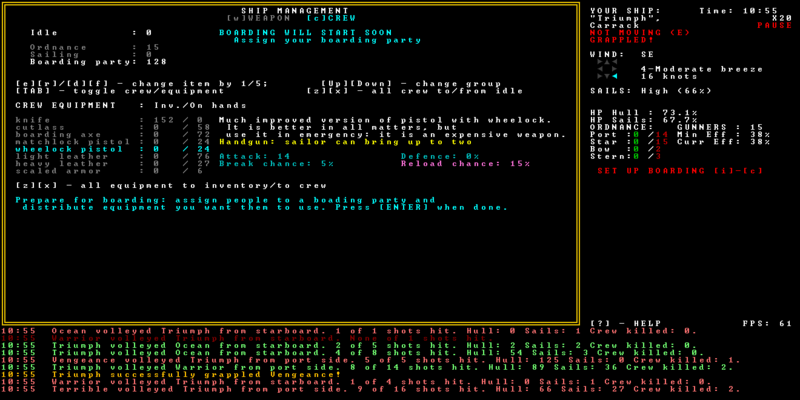 Ship management: keep track of food, gunpowder, crew; repair and replace your artillery and other equipment. RPG elements: captain skills and crew experience. Elements of fantasy, such as ancient krakens and other mystiries. Game is in development stage, and may contain bugs. Feel free to drop a email to dt-hun@yandex.ru if you have any queries. Development continues after a long break!